No one is ever born into life alone. Everyone has shared the bond of family, at least at birth, and for many people it is a bond that will follow them throughout life. For many people it is the most important bond of all. 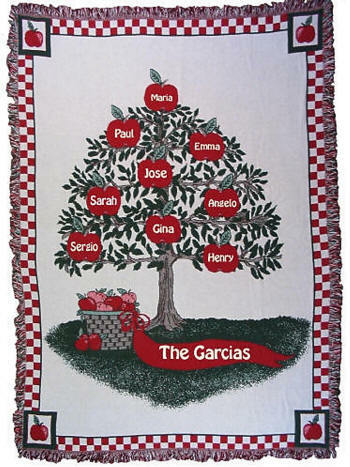 What better way to show and share that family bond of love than on a family tree afghan, embroidered and personalized with your family name and family member's names; These family tree afghans are available in three styles. Select the style which best fits your family structure. It is the perfect way to celebrate an anniversary milestone, a gift for grandparents, welcome a new member to the family, or as a centerpiece in the decor of a new home. Whatever the gift giving occasion, it is sure to bring tears to the eyes of the recipient. Each afghan is machine washable, made in USA of 100% cotton. This exceptional afghan is woven in three-layers with an off white background, checkerboard edging, and nine deep red apples on the tree. Each apple may be embroidered with up to three FIRST names (27 FIRST names maximum) and the family name will be embroidered under the tree. All embroidery is done in off white thread. Use the template to lay out the arrangement of FIRST names to fit your family structure. $4.00 each additional FIRST, MIDDLE or LAST name. LIST FIRST NAMES - *IMPORTANT put each name on a separate line.